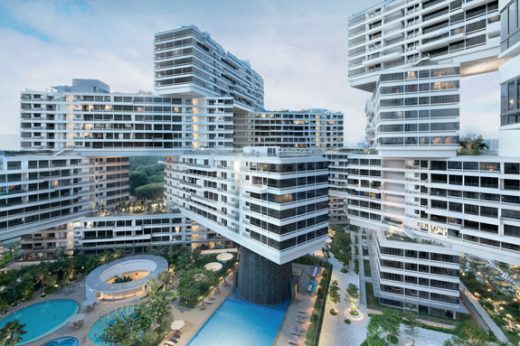 Ole Scheeren of OMA introduces a new residential typology to Singapore with The Interlace, a large-scale complex of interconnected apartment buildings stacked in an innovative hexagonal arrangement, developed by CapitaLand and Hotel Properties Limited. The Interlace is located on an elevated eight-hectare site, bounded by Alexandra Road and the Ayer Rajah Expressway, amidst the verdant Southern Ridges of Singapore. With about 170,000m2 of gross floor area, the development will provide 1,040 apartment units of varying sizes with extensive outdoor spaces and landscaping. 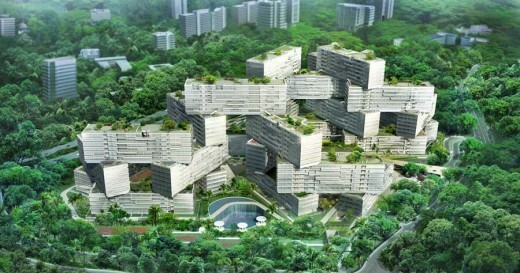 The site completes a green belt that stretches between Kent Ridge, Telok Blangah Hill and Mount Faber Parks. Designed by Ole Scheeren, partner of the Office for Metropolitan Architecture (OMA), The Interlace breaks away from Singapore’s standard typology of isolated, vertical apartment towers and instead explores a dramatically different approach to tropical living: an expansive interconnected network of living and communal spaces integrated with the natural environment. 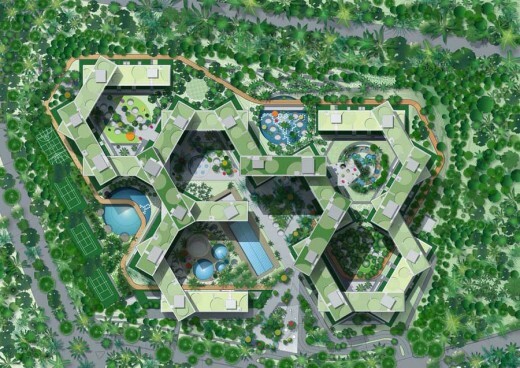 Thirty-one apartment blocks, each six-stories tall and identical in length, are stacked in a hexagonal arrangement to form eight large-scale open and permeable courtyards. 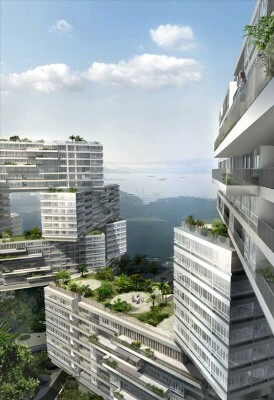 The interlocking blocks form a vertical village with cascading sky gardens and both private and public roof terraces. The design capitalizes on the generous size of the site and further maximizes the presence of nature by introducing extensive roof gardens, landscaped sky terraces and cascading balconies. Above-ground vehicular circulation is minimized, liberating large green areas within the development. The Interlace incorporates sustainability features through careful environmental analysis of sun, wind, and micro-climate conditions on site and the integration of low-impact passive energy strategies. While maintaining the privacy of individual apartment units through the generous spacing of the building blocks and far-ranging views, the design also features communal spaces for shared activity. Extensive residential amenities and facilities are interwoven into the lush vegetation and offer opportunities for social interaction, leisure, and recreation. The design is led by Ole Scheeren together with Eric Chang, Associate of OMA. Scheeren is responsible for the office’s work across Asia, including the China Central Television Station (CCTV) headquarters and the Television Cultural Center (TVCC) in Beijing, and the MahaNakhon Tower in Bangkok. His previous work includes the Prada Epicenters in New York City and Los Angeles. CapitaLand is one of Asia’s largest real estate companies. Headquartered and listed in Singapore, the multi-local company’s core businesses in real estate, hospitality and real estate financial services are focused in growth cities in the Asia Pacific and Gulf Cooperation Council (GCC) countries, and in Europe. The company’s real estate and hospitality portfolio spans about 120 cities in over 20 countries. CapitaLand also leverages its significant asset base, real estate domain knowledge, financial skills and extensive market network to develop real estate financial products and services in Singapore and the region. The listed subsidiaries and associates of CapitaLand include Australand, CapitaMall Trust, CapitaCommercial Trust, Ascott Residence Trust and CapitaRetail China Trust. Hotel Properties Limited (HPL) was listed on the Stock Exchange of Singapore in 1982. Starting with just the Hilton Hotel in Singapore, HPL has expanded rapidly over the years. Today HPL has interests in 21 hotels spanning 9 countries and has established its position as a niche property developer of prime residential properties.